This is what draws all the attention, and no wonder. Dave scratch built all but a few pieces. He machined the 50s'era Chrysler 354 Hemi block from ABS plastic. He machined the heads and every other engine part that looks like aluminum from aluminum. During the restoration, the original oil filter was no where to be found. Norman machined a truly impressive replacement. When it comes to the engine's plumbing, the hard lines are made of .035-inch stainless steel welding rod and braided wires of various diameters make up the soft lines. 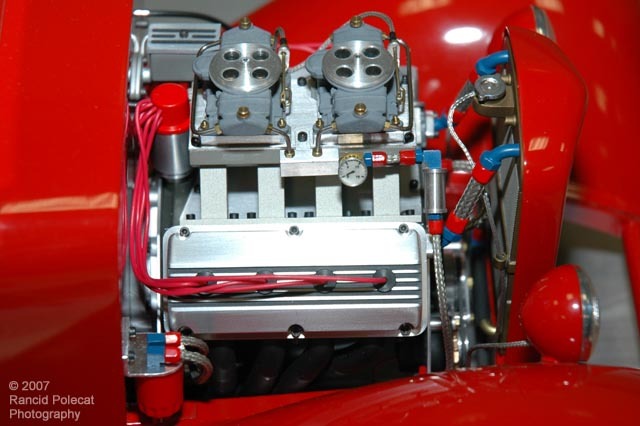 The carbs started life in a Golden-T kit and have been treated to machine aluminum tops and brass fittings.